The fruit of the black cherry tree can be a blessing or curse depending upon the tree's location. Like other cherries, the black cherry is edible and can be quite delicious. A quick online search reveals recipes for cobbler, ice cream and tea. On the other hand, the fruit of this tree can be its most significant negative. 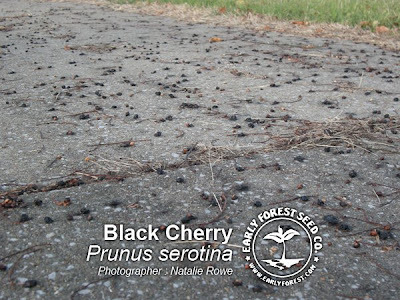 When planted near streets, driveways or yards the fallen cherries can become impossible to manage resulting in the staining of surfaces and an abundance of litter (as seen in the photo above).